One day I was scrolling through social media and stumbled upon one of my new favorite blogs, Sharp Dressed Fan. Kirsten is the fashionable eye behind the site and as a devoted baseball fan, she puts together truly eye-catching team outfits that include unique pieces from local designers right in the team's hometown! Of course, I had to ask her to chime in with her picks for the historic 2016 World Series featuring the Chicago Cubs and Cleveland Indians. These outfits have me rooting for both teams! Which one is your favorite? Let me know in the comments! It's the most wonderful time of the year for baseball fans - the World Series has begun! This postseason brings about a historical match-up between two favorite underdog teams, the Cleveland Indians and the Chicago Cubs. As neither club has won the big game since the 1940s, both teams are chomping at the bit for the chance to be champions! I've assembled looks for Indians and Cubbies fans, complete with locally-made pieces, to ensure they'll be styled for the win. This Indians pairing dresses up a simple team sweatshirt with leather trimmed pants and of course, a cute and practical anorak in the team's color navy. Rather than the popular Chief Wahoo cap, I avoided the controversial mascot and instead, included a piece by a Native American artist from Beyond Buckskin. The boots are also reminiscent of a tribal blanket and are stadium-friendly with a thick, stacked heel. 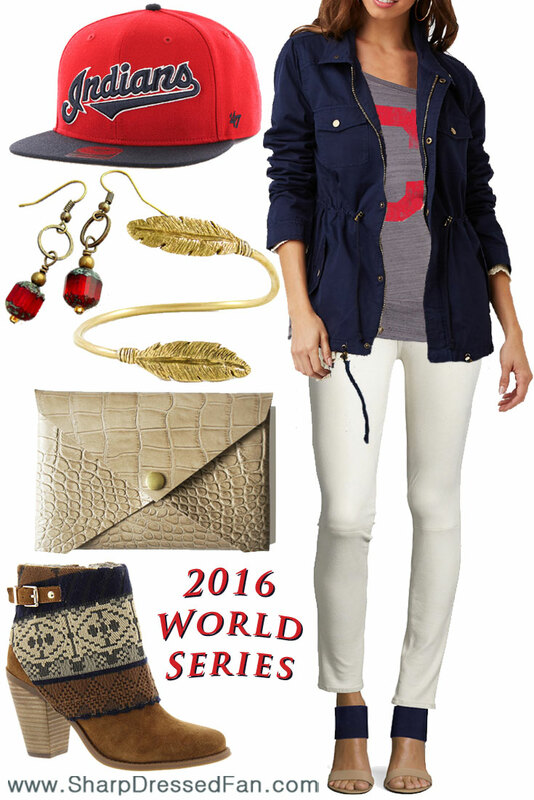 A lovely, origami-style clutch and red earrings finish off this look with some great accessories made by Cleveland locals. For the Cubs, I started off with some sparkle, choosing a glittery team top and layering it with a fun, versatile royal blue jacket. To keep warm at Wrigley, I added in some skinny corduroys and found a matching scarf made by a Chicago local. Luckily, the same can be said for the fabulous tassle necklace, ring and red bag as well - the Windy City is bursting with some talented designers! To complete this look, I hunted down a pair of strappy flats (so popular this season!) in Cubbies blue. No stilettos for games, ladies! Let's keep it real... and comfy! Thanks so much to Kathy, the amazingly talented Style Ref, for hosting me and good luck to both teams - I'll be watching! Seeking the best of both worlds, Kirsten is a New York girl living and working by the beach in California. 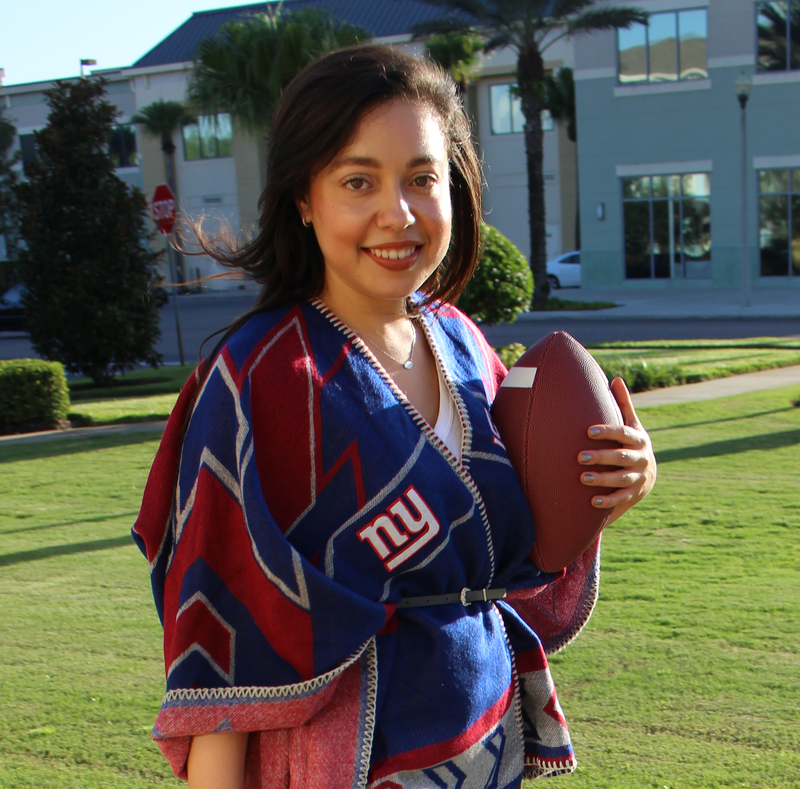 She created Sharp Dressed Fan to provide stylish options for fans of all kinds, starting with her beloved baseball, and soon branching out beyond sports! You can follow her adventures on www.SharpDressedFan.com, or follow her on Instagram, Twitter, and Pinterest @SharpDressedFan.